See? He already knows the rules and everything! Stephen Hillenburg died this week, with animation fans worldwide expressing their sadness at the loss of the endlessly creative, wonderfully goofy creator of SpongeBob SquarePants. 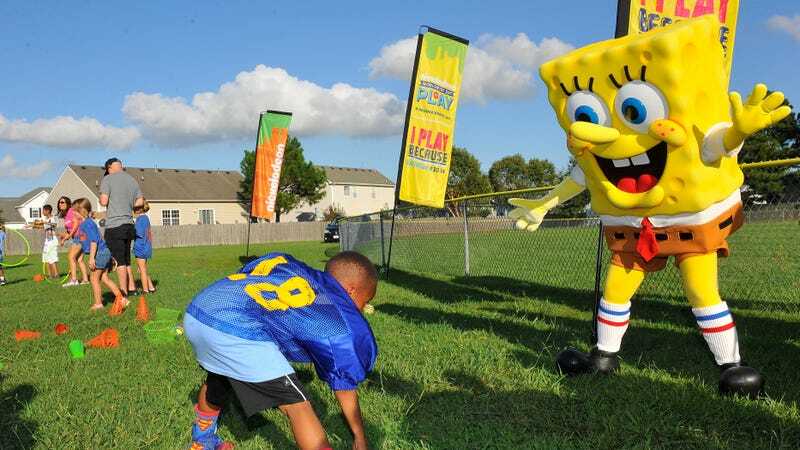 Now, Vice reports that one particular effort to pay tribute to Hillenburg’s enduringly/endearingly weird legacy is picking up quite a bit of online steam: Dear NFL, won’t you please let SpongeBob play the Super Bowl half-time show? Specifically, people are flocking in droves 100,000 strong to petition for “Sweet Victory”—a song that featured prominently in the show’s second-season episode “Band Geeks”—to get its time in the spotlight at Super Bowl 53. Written by Bob Kulick and David Glen Eisley—who also sang it, pinch-hitting for Tom Kenny with an authentic ’80s rocker warble—the tune was supposedly pulled from a library of royalty-free music by the show’s creative team when they were looking for some real power ballad power to close out Squidward’s big day. They found the perfect choice: Blindly optimistic, silly, and yet fun as hell, the track perfectly suits SpongeBob, whether he’s singing for himself, or belting it out in front of millions of very confused American football fans. And while we all know that the average Change.org petition has all the force of a wet noodle floating at the bottom of Bikini Bottom, we can’t stop our inner Patricks from getting their hopes up, just this once, that the petitioners might get their way. After all: At the very least, it’s gotta be better than Coldplay, right? Are you ready, kids (for some football)? !